Was the groundskeeper played by Charles S. Dutton a real character? all through my life. I would encounter people like that and they would help me get through the tough times through their wisdom and their encouragement." Was there actually a priest who helped Rudy get into Holy Cross Junior College? In the same Notre Dame Pigskin Post interview as above, Rudy Ruettiger replied to this question by saying, "There were several who played important roles, but, again, you cant develop them all in one two-hour movie." Did Rudy really sleep in the maintenance room of the football stadium? Rudy actually slept in a room in the basketball arena. The school had the room there for someone to stay during off-hours for insurance reasons. Was coach Dan Devine really that cold-hearted against dressing Rudy for the last home game of Rudy's college career? 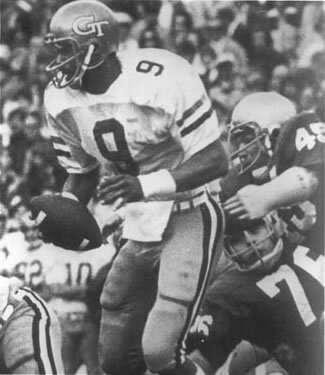 In Devine's autobiography, Simply Devine, he writes that it was his idea to dress Rudy for the final game of his college career and also to play him. Devine says that the screenwriter, Angelo Pizzo, told him that the plot would only work if Devine became the heavy. He agreed in order to help out Rudy, someone whom he calls a friend. "I didn't realize I would be such a heavy," he writes. Does the real Rudy Ruettiger appear in the film? Yes, Rudy does appear in the movie. He can be found near the end in the stands behind Ned Beatty, who plays Rudy's father. The real Rudy is the man Ned turns around and beats on when Rudy gets in the game. He is wearing a little hat and blue jacket. Did the studios approach Rudy to make the film or did Rudy approach the studios with his story? Rudy t-shirts let you portray the underdog. 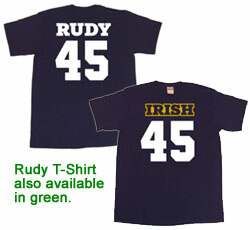 The tees resemble the Rudy Football Jersey. What does Rudy Ruettiger do today? Upon graduating from Notre Dame, Rudy spent one year as a grad assistant and then went on to work in the insurance industry. Today, Rudy works primarily as a motivational speaker, often appearing to speak in front of large corporations. He has also co-authored several motivational books (right). How much would it cost to have Rudy motivationally speak in front of your company? According to the Premiere Speakers Bureau (link to Bureau's Rudy page), Rudy's keynote fee is roughly $17,500. It could vary based upon length of presentation, location of event and other factors. Usually, travel and expenses are additional costs above speaker fees. Rudy's topics include athletes, inspiration, motivation, and overcoming adversity. Was there anyone else in the running to play the character of Rudy? Rudy answered this in an interview by saying, "Chris O'Donnell had the role. The only reason he wasn't picked was there was something about Astin at the last moment that changed their mind. I think it was his naive type of appeal. He did a great job." 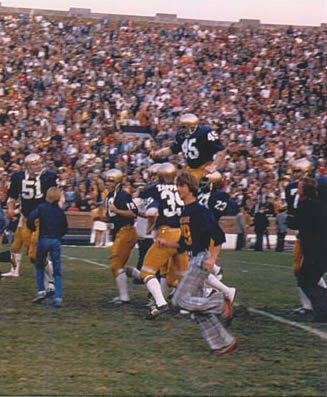 Is it true that Rudy was the only player to ever be carried off the field at Notre Dame stadium? Yes, it is true. The filmmakers recreated the scene with real fans during a break in the 1992 Boston College game. Some 60,000 fans stood and cheered as actor Sean Astin was carried off the field. In a radio show interview Rudy talks to Rama Fox and Dan Acuff (two motivational speakers and educators) on their radio show Rama and Dan's Conversations With Greatness. The interview is long, but there are some interesting tidbits throughout, at least when Rama and Dan aren't speaking. Rudy Ruettiger was born in 1948 in Joliet Illinois into a lower class family of steel mill workers. Upon graduating from high school, Rudy worked at a power plant both before and after serving in the Navy. After losing his best friend in an industrial accident at the plant, Rudy decided to no longer waste time by putting off his dreams. He set out for the University of Notre Dame with hopes of one day playing football for the Fighting Irish. After getting admitted into Holy Cross Junior College in South Bend, Rudy spent his time studying and working as a groundskeeper at Notre Dame's Knute Rockne Stadium. During his time at Holy Cross, Rudy learned that he suffered from a mild case of dyslexia, which may have contributed to his previous academic struggles. He worked around his disorder and received good grades during his two years at Holy Cross. It took Rudy three semesters to be granted acceptance into Notre Dame as a transfer student. He almost didn't make it because Notre Dame does not accept seniors as transfer students. He then won a spot on the scout team, against who the varsity team ran its plays. Through two years of hard work, he earned the respect of the Fighting Irish players and coaches, and in the last home game of his senior year, Rudy dressed for the game. During the last moments of the game, Rudy tackled the Georgia Tech quarterback. Rudy Ruettiger received his bachelor's degree in sociology from Notre Dame in 1976.